How is free water deficit calculated? 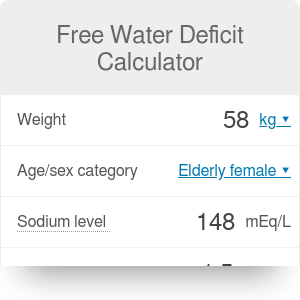 The free water deficit calculator finds the amount of water replacement needed to correct dehydration - or to reach the desired level of sodium in the blood serum. Read on to learn more about the water deficit and to understand the free water deficit formula used by the calculator. Please, keep in mind that Omni Calculator is not a doctor. If you're unwell and you're worried that you might be dehydrated, contact a physician. If you're a medical professional, you can find our anion gap calculator useful. It's an estimated value used in medicine and nutrition to assess the volume of water required to correct dehydration during the initial stages of fluid-replacement therapy. Acute symptomatic hypernatremia (under 24 hours), should be corrected rapidly, whereas chronic hypernatremia (>48 h) should be corrected slowly due to the risks of brain edema. The calculator uses 140 mEq/L as the default desired level of sodium. You can change it in the advanced mode. Free Water Deficit Calculator can be embedded on your website to enrich the content you wrote and make it easier for your visitors to understand your message.